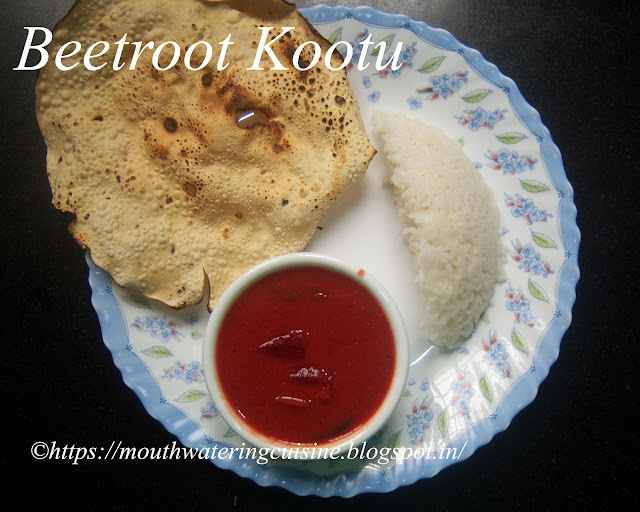 Kootu is delicious South Indian dish, can be consumed with hot piping rice and fried or roasted papad. 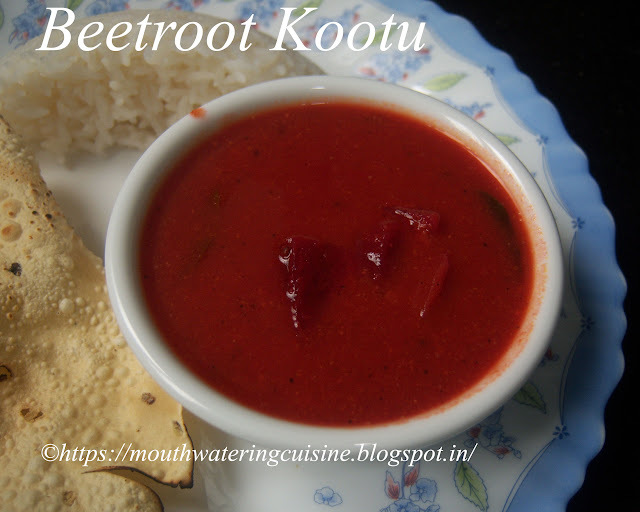 Nice aroma spreads across the home while preparing this dish, then only we will get the delicious and tasty kootu. Everyone in my home likes it very much. We need to have some patience to prepare this. Though it may not take a longer time to cook. We need to prepare and cook it in the low to medium flame, not only to avoid from burning but also to get the right consistency and to cook it completely. Preparation means making the kootu masala paste and cooking is making the actual dish here. My mother is the expert in this, she adds peanuts to it while boiling. I like them very much. On a rainy Sundays, when she makes it, it's my elder brother's duty to fry papad to serve with it. In my place, my husband and in-laws like it without peanuts, so I had to stop adding them. So they are not there in the ingredients list. Soak 1 tablespoon tamarind in water and extract juice out of it. Keep it aside. Peel and cut into cubes beetroot. Pressure cook yellow lentils and beetroot for three to four whistles, separately. Once done, mash the dal and drain excess water from beetroot pieces. Heat oil in a thick bottomed veseel, add mustard seeds, cumin seeds and red chilli pieces. When they start splutter add beetroot pieces, tamarind juice and some water. Add salt, turmeric powder and kootu masala. Mix well. Allow this to boil for 5 minutes. Add cooked yellow lentils to it. Boil it for 15 more minutes or till the aroma comes up. 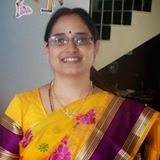 For more dals and sambar varieties click here.Thank you for visiting my blog. Hope you liked all my recipes. Any feedback and comments are appreciated.